ROCK ON MANILA: Biggest Rock Concert Ever in GenSan City! This is a wonderful news for all pinoy bands lover and rock music lovers in SOCCSKSARGEN! 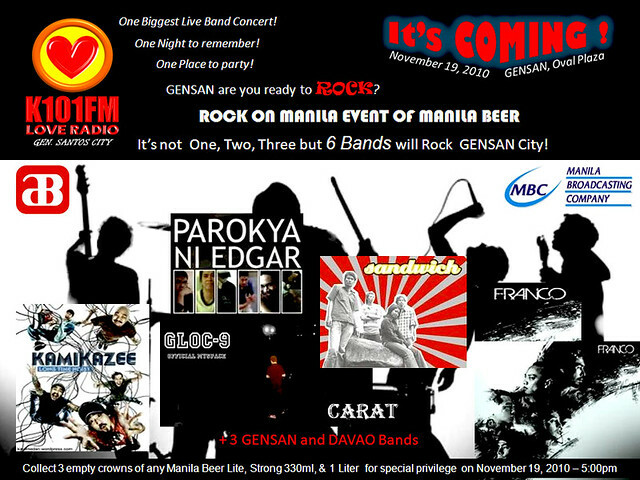 K101FM LOVE RADIO and MANILA BEER will be bringing 6 (six) of the country's hottest bands in the BIGGEST ROCK CONCERT to hit GenSan, dubbed as ROCK ON MANILA! To perform live at GenSan City's Oval Plaza this coming Friday, November 19, 2010 are bands GLOC-9, Kamikaze, Sandwich Band, Franco Band, Carat Band and Parokya ni Edgar. By the way concert starts at 5pm, click here on how to get your tickets. Thanks to General Santos News Online Mag.